By now you’ve probably seen the video of Robert Kelly, the father whose children danced their way into viral stardom.…and his BBC interview. Children look for dad, mom tries to corral them out of the room, hilarity ensues. Well, for viewers anyway. I’m not sure if Professor Kelly’s wife Kim Jung A is a stay at home parent, but watching her on all fours trying to salvage her husband’s interview summed up what many stay at home parents do daily behind the scenes. In this case, it just so happened that it took place in full view of a news camera. Stay-at-home parents. Ridiculed, minimized, poo-poohed, satirized, parodied, endlessly mocked. A friend told me a story recently. An adult at her child’s school tried, unsuccessfully, to reach my friend on the phone. When she finally was able to take the call, she was asked, sarcastically, whether she’d been too busy at tennis or Pilates. The same was asked of her child. The answer was neither, but the anecdote illustrates the value many place on stay-at-home parents. That is, usually not much. The truth is, the stay-at-home parents I know are running troops so that other people’s children can take part in Scouts. They are raising money for children in Syria, giving their time and skills to programs that help trafficked women. They are volunteering at school, heading up committees, ‘donating’ their professional skills in terms of expertise, experience, and time. Do some of them play tennis too? Sure thing. Pilates? Yup. But the idea of stay-at-home parents sucking on bottles of Proseco? Pfft. That’s only on special occasions. 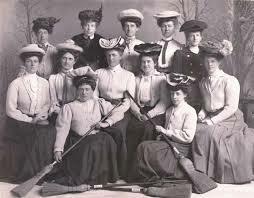 You know the folks who wield the brooms in the odd sport of curling? The ones who move ahead, sweeping furiously, freeing the ice of debris and bumps so the stone can slide freely across the finish line? Stay at home parents are those players, sweeping away all the crumbs and debris that life throws at you to help their family reach the finish line in as smooth a line as possible. It took me a long time to realize the value in what I do, to stop equating money in the bank with worth. Just because I’m not presented with a paycheck at the end of the month, I won’t minimize the way I am able to make my family’s life that much easier for them. My husband wouldn’t have the job he has now unless we agreed to move overseas, which meant I gave up my job. My being a stay at home parent right now means he can travel when he needs to, stay late at work on a moment’s notice, not worry about the school calling him up when someone’s puking their lunch up, enroll in a Master’s course, and not worry about what to do with the kids during the 14 weeks a year when they don’t have school. Generally he is able to delegate most of the boring day-to-day stuff. To me. You know, the stuff everyone hates doing. The stuff which usually makes everyone’s lives immeasurably smoother. Don’t get me wrong. I complain. Sometimes bitterly. I complain my college degree is wasted. That my kids are–right now–growing up without the role model of a mother who works outside the home (they don’t equate writing a novel or winning writing contests with work. Work to them means in an office, behind a desk). I complain about the huge portion of my day spent in the kitchen. But, my husband and I, we’re in this together. He couldn’t do what he does as smoothly if I was working outside the home. I couldn’t do what I do (right now that’s writing novel 2) if I was working. Despite the trade offs (and there are always trade offs), we make it work. Do we miss the cushion of another salary at times? Absolutely. But just because it doesn’t result in a direct deposit into our joint account doesn’t mean my role in the family is worthless. I am the sweeper. Rememberer of cards and buyer of birthday presents, scheduler of conferences and vaccination up-keeper. I am able to pick up the slack for those mothers I know who are earning outside the home, volunteering when they can’t, helping out on field trips and class events, things that wouldn’t happen otherwise. Stay-at-home parents are often the ones car pooling everyone else’s kids, standing in during emergencies, reading to another mother’s child at an open house because she couldn’t get the time off work. I’m not writing that to make working parents feel guilty. On the contrary, I am then able to point out that working mother as an example to my own children. Working parents have to figure out all of this stuff too, and it’s stressful. Our choice for me to stay home leads to less vacations, less dinners out, but it also leads to less stress for my husband and kids–and at times, more for me. These are all the things going on behind the normally locked door while Mom or Dad is giving an interview to the BBC. Or going on in the house when Mum or Dad is in the office. Keeping the kids quiet, entertained, fed, healthy, play-dated, socialized, and out of the way so the working parent can do their job, do it well, do it with a little bit (or a lot) less stress. I’m aware how lucky we are for me to stay home and be that sweeper. I know that for many, many families, they are playing all the roles at once. 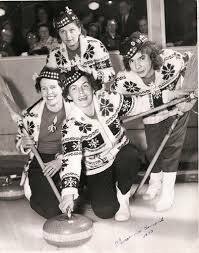 Sweeper, curler, coach, referee, stone, and hell, even the ice. I’m grateful for the opportunity, to stay at home, to volunteer, to write; grateful we’ve been afforded, quite literally, this chance. But I also expect my family to be grateful for what I provide as well, both behind the scenes and out in front where everyone can see. Do We Still Need Buffy? When my (future) wife and I were discussing the future, before we took the steps to have one together in a formal and committed way, we covered the necessities of income and childcare, career aspirations and whether we’d even want to be together long enough to raise a family. The kind of light banter that works like a plow in the field, turning over the surface weeds and letting one see if the ground is fertile and moist, or dry and crumbly. Do we plant? If so, what? And how do we split up the work? At the time, I had a career that was full of promotions and opportunity. The money was good, enough to support both of us. My partner was working at developing her artistic career – something that is not particularly well valued (or paid) by North American society. Her work was (and continues to be) brilliant, but the marketing and shmoozing required to get into galleries and the like was not her cup of tea. However, we naively thought that as the kids start to come, she’d have time to continue working on her art as a stay-at-home mom. Suffice to say that one of the reasons our three daughters have turned out quite well is the work that my wife put into making sure they knew opportunity, and discipline, fun and responsibility. I also contributed, by sharing the evening reading rituals, the homework supervision, the sports team coaching, the field trip organizing, and the many things one does to make a family work. We took turns at the rituals of walking a crying child (sometimes two at a time) to sleep, or dealing with the occasional meltdowns that derive from the realization that this big world beyond your fingers isn’t going to do the things you want it to do. Being a stay-at-home parent is hard work. Done well, it requires patience and good grace under pressure, persistence to carry out what has to be done no matter how tired or distracted, and remembering why one is doing this in the first place. There were days when on coming home, I got the kids wordlessly handed to me, and the love of my life would go on a long walk. Those days are part of parenting that the parenting books don’t seem to cover. And yet… now that our three daughters are all in various stages of growing THEIR families, there’s nothing that I wouldn’t do all over again, even if I knew then what I know now. A stay-at-home parent is becoming a luxury now. With pressure to keep up appearances and lifestyles, it seems that both parents now have to work, and sometimes at more than one job, with the kids being raised partly in daycares, partly in school, partly on the street, and partly at home. Both I and my wife are grateful that we were fortunate enough to have the luxury of her being able to be the stay-at-home parent. And when it comes to that task, perhaps we don’t know what we had until we have it no longer. My daughters (and son-in-laws) may not have that luxury – they may need to be out there in the workforce, with the children being cared for in various daycares. One other thought. Being a stay-at-home parent teaches skills that few universities can. When my wife went back to work after the children have grown up, her organizational skills, her ability to prioritize and delegate, are the envy of her co-workers. She works with kids as a pre-school art teacher, and she know what those kids are actually going through better than their parents do. She can create crafts and conjur materials out of thin air. When precious Elisa is having a melt-down, it is my wife who reaches into that bag of skills she picked up and calms her down. She puts those extra eyes that all mothers grow in the back of their heads to good use on an almost daily basis. Meet my wife, the one who molds the raw clay of childhood into some pretty nifty adults. This deserves a more well thought out reply and response and it is rapidly approaching my bed time…but I just wanted to pick up on your last comment–about stay at home parents having skills others are missing–it’s true, and it’s, I think, even more true with women who learn to expertly compartmentalize their time and interests, compromise, negotiate, etc. It’s one of the reasons I want to see more women, and more mothers, in politics! I was also a stay at home mom. Your words are very true, sometimes the family doesn’t appreciate what we do because they know no different. At times I found it hard and had to remind myself that being at home was as important of a job as working out. Oh, there are plenty of days I feel like hired help, that’s for sure–except without the salary! I think it’s a constant balancing act for many women, and particularly for women of my generation who were raised to have careers AND families and who feel like they are somehow lacking when they realize how difficult it is to do both well. Well stay positive 🙂 it is worth it. Earning a living is important. But even more important is the task of raising the next generation, to be smart, resourceful, resilient, mentally strong, with a good understanding of how the world really works, and being able to deal with the unfairness of much of life. Those are not things that formal education gives them – rather these are ingrained through parental example and parental guidance and discipline. Very few of us (if any!) are self-made – most of us have benefited from the lessons that our mothers (and fathers) imparted to us along with the values, world-view, and the personal characteristics that make adults what they are. Nature and nurture combine in ways we still don’t fully understand, and yet without the nurture, the nature has a hard road ahead of it. Those who have never been parents have really no clue what it is really like, and how hard it can be. That’s not to say that every person should be a parent, but parenthood is an experience that is truly life-altering. Neither my wife, nor I am the people we were before being parents – it changed us in ways we had no idea would happen. And at least in my world, being a “mother” is as valuable a human function as any of the ones that generally receive more credit. It’s interesting that among my daughters (and their partners), the decision of who gets to stay home and who gets to go to work is not automatic (breaking down on a gender basis), nor is it immutable. With steady careers being (almost) a relic of the last century, one’s ability to live in the current world requires both more flexibility and much more resilience. Good for you, you’re right that being a stay at home parent definitely isn’t anything to be ashamed of. My mum was a stay at home parent whilst I grew up, and whilst there would’ve been nothing wrong with her working if she’d wanted to, it was nice that I got to spend more time with my parent than I would’ve done if she had been at a job. I also feel like there is a lot more stigma surrounding fathers staying at home to look after the kids than mothers, and that many don’t do it because they’re afraid of being labelled as ‘not a real man’ or whatnot. And it’s a shame because I feel like it can help fathers to bond with their children as well as mothers. It’s definitely changing. When I think about the involvement of my own father vs. that of my husband, the difference is enormous–and that’s down to the mothers who raised their sons to be more involved fathers I think. You know, I think that stay at home dads face a whole host of issues I’m not even aware of, to be honest. It has got to be hard for them–but at the same time, they’re often given rock star status as if their decision to give up work and stay at home is more meaningful than a mother’s. I think that’s changing, but it will be a slooooow evolution. Stay at home dads aren’t given a rock star status. Usually they are patronised. I know some. Including my nephew. His wife was earning more than he was. It was a natural and mutual decision. My son worked from home till his children started school. His wife also works from home. What I’ve noticed is that the parent who stays home and has the experience is one up on the poor parent who misses out on hours of bonding time, especially those first vital years. There is definitely some patronizing–but what I meant by ‘rock star status’ was more along the lines of it’s a big deal when a father gives up his job to stay at home, whereas it’s not even thought about if it’s a mother. That is changing, as the roles balance out a bit more, and I think that can only be a good thing. That said, I think there are a whole host of challenges that affect men who choose to stay at home that I, as a woman, know nothing about. I imagine it’s lonely at times, it’s difficult to break into ‘cliques’, and what they bring to the table as a ‘father’ may not be as accepted as what’s brought to the table as a ‘mother’. Wouldn’t it be great if we reach a point where we respect the parent, without any thought as to if it’s the mother or the father? It’s one of the reasons I tried with this particular piece to make sure I included men, and by talking about the stay at home parent as opposed to only the stay at home mom. All good stuff to ponder! Thanks, Priya, I look forward to reading it. You’re absolutely right. I try to refer to it as ‘earning’ outside the home rather than working, because there is definite economic value (and savings) when there is one parent who stays at home. Staying home and raising the children you chose to have used to be the norm. Now other people raise them. That’s why it’s so important to put down stay at home parents. Nice post, but you don’t need to justify your job. It seems to me that that is what the other side is doing. To be honest, the piece was the result of a series of conversations I had with friends, who were definitely feeling like their roles were being minimized. I hit that point, but a long time ago. I’m confident what I do is what is best, for my family. Of course I can’t, nor would I want to speak for other families who chose differently. And many have no choice at all. I just hope one day we can all see the value in the contributions we ALL make. Parents, teachers, business leaders, healthcare workers, hotel employees. WE’re all contributing something to the fabric of society, we’re all making someone’s life a little easier. Wouldn’t it be great if we could just recognize that without putting a $$ value on it. 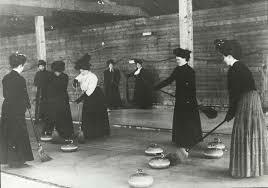 As a fellow stay at home/work at home Mum I can identify with this and love the metaphor of the curling sweeper. So true! Each day has a lengthy to do list of home stuff that is never complete and I work part time at weekends and spend the school days catching up on freelance admin, lesson preparation and marking too. I enjoy the flexibility this way of working gives me, that I can spend more time with my son, and that I do not have to worry so much that an urgent call from school will take me away from work and that I will have to deal with the consequences of that from employers. Being stuck in low pay work and lacking security of a salary, holiday pay and pension is obviously a drawback. And I do get frustrated when anyone makes assumptions about what I do, especially the idea that I have lots of time on my hands!